When replacing tires, never mix radial and bias-ply tires on the same car. 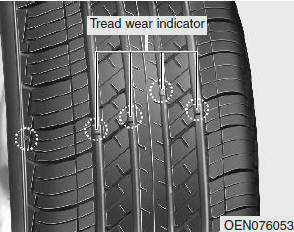 You must replace all tires if moving from radial to bias-ply tires. Wheels that do not meet HYUNDAI’s specifications may fit poorly and result in damage to the vehicle or unusual handling and poor vehicle control. The ABS works by comparing the speed of the wheels. Tire size can affect wheel speed. When replacing tires, all 4 tires must use the same size originally supplied with the vehicle. Using tires of a different size can cause the ABS (Anti-lock Brake System) and ESC (Electronic Stability Control) to work irregularly.